Tables are closed within separated drag containers so elements from first table cannot be dragged to the second table and vice versa. REDIPS.drag inclusion and initialization will enable drag-n-drop for all elements found inside drag containers (one or many) – and this is just a skeleton. 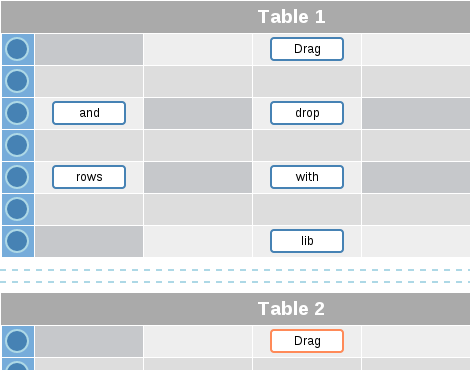 Application logic and rules will be realized inside event handlers (like moving mirrored element from other table or locking movement while animation is not finished). From version 4.3.0+, table content and rows can be moved to target position not only by dragging but also by using public method moveObject(). In next few examples you can see how DIV element or table row can be moved from source to the target position. Method offers definition of callback function after moving is over. // animation is finished display alert "Finished"
Minimized and gzipped, REDIPS.drag library is less than 10KB. Here is compressed version used in this demo: redips-drag-min.js.jgz. Complete list of public properties and methods is documented on REDIPS.drag documentation page (generated with JsDoc Toolkit). Inside redips2.tar.gz package you will find many examples and well commented source code ready for modification. @Phil – In one time user can drag one DIV element. If you need to clone two DIV elements at a time, please see example Example 18: Simple element animation. In this example is possible (with some JS logic) to clone more than one DIV element and to place it on TABLE cells. You will have to know destination cell for such action. Maybe example Example 12: Select and move more elements will be also useful for your case. You can click on a cell to mark it and then cells can be merged or split (with click on a button). So, this functionality can be written inside event handler like you asked. This way, cell merging will be executed on DIV drop. Hope this hint will be useful and if you have additional question, please be free to ask. is it posibble to limit the redips-rowhandler so it will move just 3 row of entire row?